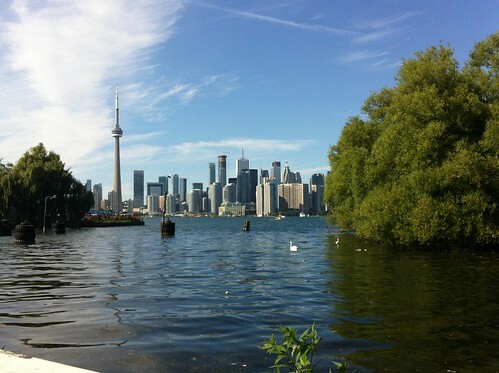 What can you see and do with 2 days in Toronto with kids? We visited Toronto with a toddler and a 4-year-old: these are our favourite things to do in Toronto with kids, favourite family friendly hotel and Toronto with children highlight. Until the moment it entered my window-seat field of vision, Ontario had been, for me, the stuff of dreams. I first learned its name on the Risk board, along equally evocative names such as ‘Kamchatka peninsula’ and I could hardly believe that now we were only minutes away from landing beside its shores: Toronto airport was now in sight. Toronto wasn’t our final destination: our home exchange was waiting for us in Montreal, but thanks to convenient airfares we were lucky enough to be able to plan a couple of days in this incredible city. We had about 48 hours there and we knew we would make the most of them. We got to Pearson international airport in the evening and we immediately got a cab to out hotel. We don’t often stay in big hotels, as a family, but for Toronto, we made an exception and booked a room at the Eaton Chelsea Hotel, Canada’s largest hotel right in the centre of the city, between Gerrard street and Yonge street. We found the hotel online and we were attracted by how family friendly it seemed (we also got a great online deal with booking.com). The site promised a kids’ playroom, a children friendly pool and family rooms and a very child friendly, warm atmosphere is exactly what welcomed us on arrival. The Eaton Chelsea has a vast, luxurious lobby complete with bars, restaurants and fluffy sofas. Cranky children and fancy hotels are not often a good match and it was with some apprehension that we joined the line of air hostesses checking in ahead of us. But our fears were misplaced. As soon as we joined the line, the reception staff came to us with a present for the kids: each of them got rubber duckies and a book, a precious possession they are still fond of and that made the check in procedure immensely more pleasant! The hotel was all we had hoped for and provided us the perfect base for our two day urban adventure. We got to Toronto in the evening, so our first expedition out was for FOOD. Toronto has an amazing food scene and our central location made us spoilt for choice. Walking down Yonge street, skyscrapers towering over us, we could choose between fine dining, burger joints, sandwich bar and watering holes popular with the after work crowd. Venturing into the smaller side streets, the choice widened, with ethnic restaurants to quit all tastes. In our time in Toronto, we sampled several places, including Mr Green jeans, in busy Eaton Centre, where we had a juicy and very generous burgers (and lovely dessert). 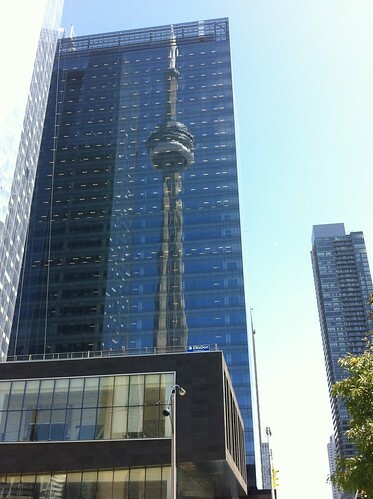 Toronto is a big city but it is possible to get the first glimpse of some of its main landmarks on foot. The next morning, we ventured into the bright sunny day and started following the shiny top of the CN tower, visible ahead of us, towering over all other buildings. The tower is indeed very impressive and on a clear day the views from its top deck promised to be amazing but being short on time in the city, we decided to skip the long queue. The sign telling us it would take at least two hours to get to the lift spoke straight to our hearts: the kids would never accept such a long wait and we were better off enjoying the tower from below, trying to catch its reflection in the nearby buildings. The tower is part of a wide complex that includes the Rogers centre, the big Toronto stadium that boasts a fully retractable dome roof (we saw it opening later in the day: the kids couldn’t believe their eyes!). Football and baseball are played in the stadium and while there was no match on, we could still feel the unmistakable buzz of the sports enthusiasts visiting their sports temple. From there, it is just a short walk to the pier and ferries to the islands, which is where we spent the rest of the day and ended up being where our fondest Canadian memories were built. The queue at the pier was long but swift and in less than 10 minutes we found ourselves aboard a ferry across lake Ontario, on the short ride to centre island. The cheerful crowd of families with cooler bags and shorts told us we had picked the right destination: the island is a family paradise! The main attraction for the kids there was the theme park (Centreville amusement park) . Built like an old town, complete with replica steam trains, a farm and western-style post office, the park has rides for all ages, most of them accessible also to little children. The many restaurants offer from burger to pizza and the ice cream shops dot the place. As well as the park, the island has access to the lake, in the form of a beautiful beach. On this gorgeous days, families were swimming and dipping in and out of the water. The strong sun made me think of joining them, but all it took was to dip a toe in the water to change my mind: used to the Mediterranean, I classified lake Ontario as ‘freezing cold’ and retracted, defeated, to its beautiful golden shores! Lake Ontario was the fist thing we saw on arrival and our last stop before departing. Ahead of us, we had a trip to the Niagara falls and the many more wonders of Ontario and neighbouring Quebec. We said goodbye to the lake sure of a great holiday ahead of us.